On the sidelines of the COP21 in Paris, many Christian and interfaith initiatives are being taken. We give an echo here of the events related to Taizé. 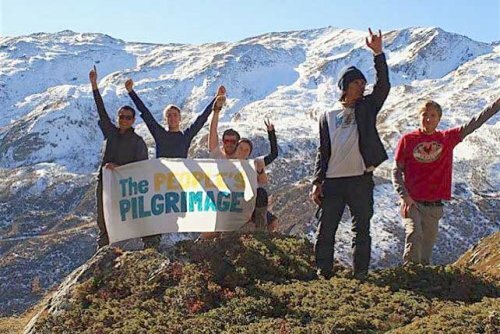 Under the name of "People’s Pilgrimage", inter-religious walks are being held across all five continents to demand with a single voice a future protected from the disasters which climate change could bring. In May 2015, after leaving his post as ambassador responsible for negotiations on climate change for the Philippines, Yeb Sano began a pilgrimage of several months, heading for Paris and COP21. After a visit to Rome, the pilgrims walked for more than 700 kilometers in Italy and then crossed the Alps to Geneva before arriving in France on 6 November. After a meeting at Cluny on Friday 13 November and a night spent with local people in their homes, the delegation will walk along the cycle path in the valley and arrive in Taizé late morning Saturday. A meeting open to all will be held on Saturday 14 November at 3:15pm in Room 15. During the climate negotiations of COP21 in December, faith communities from around the world are organizing a whole range of events in Paris: vigils, meetings, festivals, prayers, pilgrimages … A complete list can be found on-line, including a special programme in the parish of Saint Merry to welcome the pilgrims arriving in Paris along four different routes. At the invitation of Cardinal Vingt-Trois and the Council of Christian Churches of France, leaders of various churches, including Patriarch Bartholomew, will pray together in Notre-Dame de Paris on Thursday, 3 December. Brother Alois will be present. In cooperation with the Council of Christian Churches of France and the diocese of Paris, a prayer with the songs of Taizé, attended by Brother Alois and other brothers, will be held on Saturday 5 December, at 8:30pm, in the church Saint-Ignace, 33 rue de Sèvres, Paris 6. Young people who can help with the preparation of this prayer are invited to write to this address info2015 taize.fr, in particular the delegations coming from different countries. On 5 December many events will be held. These include a youth programme in Montreuil and a bi-lingual conference led by A Rocha International in St. Michael’s Anglican Church in Paris.